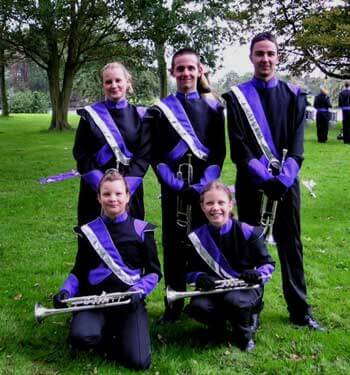 "This is a photo of the 2004 trumpet line from Distant Thunder Show Corps, who are based in Bedford, England. It was taken right before the Drum Corps Europe Championships in The Hague, Holland, on the Sepetember 25, 2004. This was the first time that they had competed in this competition and they were delighted to win 'A' Class. "Pictured are (back row from left) Aimee Smith, James Allen and Matt Sewell. In front are Josephine and Antonia Storey (my daughters). This was the first time that the corps had been into Europe to compete and they had a fantastic experience, to be repeated in 2005." Thanks Anna!